The family of protein tyrosine phosphatases (PTPs) includes 107 genes in humans that are diverse in their structures and expression profiles. The majority are present in immune cells and play various roles in either inhibiting or promoting the duration and amplitude of signaling cascades. Several PTPs, including TC-PTP (PTPN2) and SHP-1 (PTPN6), have been recognized as being crucial for maintaining proper immune response and self-tolerance, and have gained recognition as true immune system checkpoint modulators. 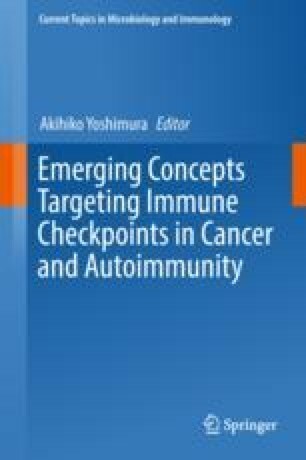 This chapter details the most recent literature on PTPs and immunity by examining their known functions in regulating signaling from either established checkpoint inhibitors or by their intrinsic properties, as modulators of the immune response. Notably, we review PTP regulatory properties in macrophages, antigen-presenting dendritic cells, and T cells. Overall, we present the PTP gene family as a remarkable source of novel checkpoint inhibitors wherein lies a great number of new targets for immunotherapies. C. Penafuerte, L.A. Perez-Quintero, and V. Vinette have equally contributed to the writing of this chapter. We thank N. Uetani for expert graphical assistance. In addition, we recognize the support of the Canadian Institute of Health Research (grant MOP-62887) and the Aclon-Richard and Edith Strauss Foundation to M.L.T., V.V. is a recipient of the Charlotte and Leo Karassik Family Foundation Fellowship, T.H. is a recipient of a Fonds de Recherche du Quebec—Santé studentships. M.L.T. is a holder of the Jeanne and Jean-Louis Lévesque Chair in Cancer Research.